Clogging is a fast-paced, foot stomping form of dance, and the three Squire sisters love it! The oldest, Michelle, began clogging 12 years ago at age 3. Seeing how much she enjoyed it made Kayla and Heidi want to clog, too. At that time Kayla was 6, and Heidi was 4. Now 6 years later, all 3 of the girls are still going strong and loving it! One of their favorite performances was at the International Folk Festival in Springville, UT in 2013. 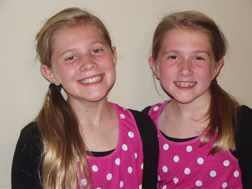 Kayla and Heidi are 2 years apart in age, but have often been mistaken for twins. This past school year the two of them choreographed and performed a duet, first for their school talent show, and then for performances in Idaho and other parts of Utah with their studio. The music for the duet is, If I Didn’t Have You, by Randy Newman. It is a fitting song considering the close relationship the girls have with each other, as well as with Michelle, their 2 brothers and their parents. They come from a family that enjoys each other and spending time together.